I have been quiet for two weeks, and been very negligent of my blog and those interested in what i’m up to. Well I have been hard at work on my comic that I mentioned earlier but have decided not to post any of my progress as of yet. I have been scrambling to get everything ready for the up coming convention known as APE (Alternative Press Expo) which Brynn and I will once again be a part of (its been a year already?!?!). I will have a lot more goodies this year and I will be posting previews of everything in the coming weeks. In the mean time, enjoy this sketch of Battle Cat from He-Man i drew a little while ago. Just imagine he is an awesome green with yellow stripes! So that’s it for today folks, more posts are on their way, just hang tight. 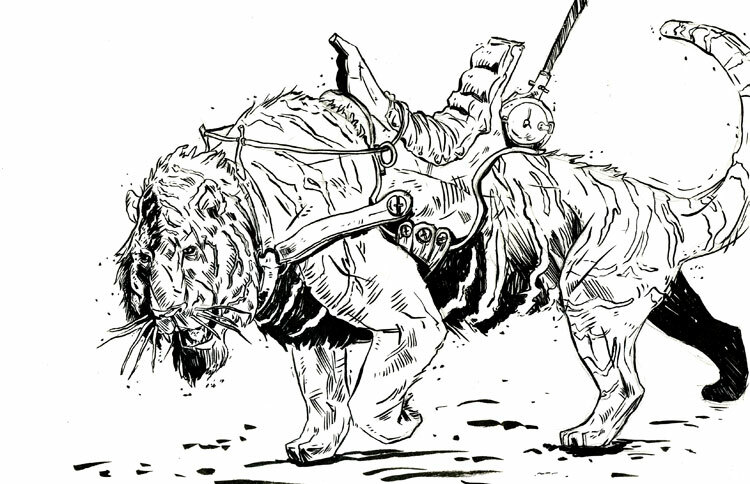 This entry was posted in Conversations, Miscellaneous and tagged 80's, APE, sketchbook. Bookmark the permalink.